The European Central Bank (ECB) has pumped 95bn euros (£63bn) into the eurozone banking market to allay fears about a sub-prime credit crunch. The ECB made the money available in the form of loans, an offer taken up by 49 banks and other financial institutions. This came after French bank BNP Paribas suspended three investment funds worth 2bn euros (£1.35bn), citing problems in the US sub-prime mortgage sector. It said it was "impossible to value certain assets" in an uncertain market. US lenders have suffered a sharp rise in defaults on higher-risk mortgages and it is feared that the financial repercussions of this slump could soon spread to Europe. The ECB described the move as a "fine-tuning operation" for the banking market, but it represents the bank's single largest intervention in the banking sector since the immediate aftermath of the 9/11 attacks on the US in 2001. "The longer-term fear is that these liquidity issues could spill into the wider economy," Ciaran O'Hagan, a Societe Generale analyst, told Dow Jones Newswires. "The prompt intervention of central banks puts off the day of reckoning." The three funds BNP Paribas has suspended are Parvest Dynamic ABS, BNP Paribas ABS Euribor and BNP Paribas ABS Eonia. BNP Paribas said the valuation of the suspended funds would resume "as soon as liquidity returns to the market". Other banks have also suspended funds with sub-prime investments. "The complete evaporation of liquidity in certain market segments of the US securitization market has made it impossible to value certain assets fairly regardless of their quality or credit rating,"' BNP Paribas said in the statement. Defaults on the loans, which are aimed at those on low incomes or with a poor credit rating, have risen as interest rates charged on the loans have risen. 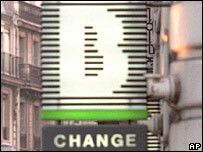 News of the move sent BNP Paribas shares down some 4.5% in Paris. Also on Thursday, Dutch bank NIBC announced losses of 137m euros from asset-backed securities in the first half of this year. The bank said "severe instability in the US credit fixed income markets" had been a factor behind the fall. In June, US bank Bear Stearns had to spend $1.6bn to bail out two hedge funds, which had a strong focus on sub-prime loans. The bank had invested heavily on securities that were backed by sub-prime mortgages.